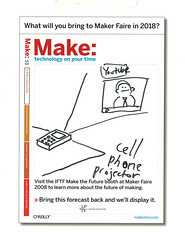 Being the only IFTF staffer based in New York City, I've been taking a "maker" approach to office space. Why carry thousands of dollars per month overhead in this overheated real estate market, when there are any number of wireless parks and coffee shops to set up shop at? Jason Tester, Chris Sumner, Chris Noessel, and Mike Love's modified newsstand showing headlines from the future won an Editor's Choice blue ribbon at Maker Faire last weekend. Thanks to everyone who came by our booth to draw a vision of the future, record a video about the future, or just chat with us about who we are and what we do. We had a great time. We're currently thinking about the best way to share the videos and MAKE: 2018 covers online. As soon as we get that figured out we will put them up and announce the location here.